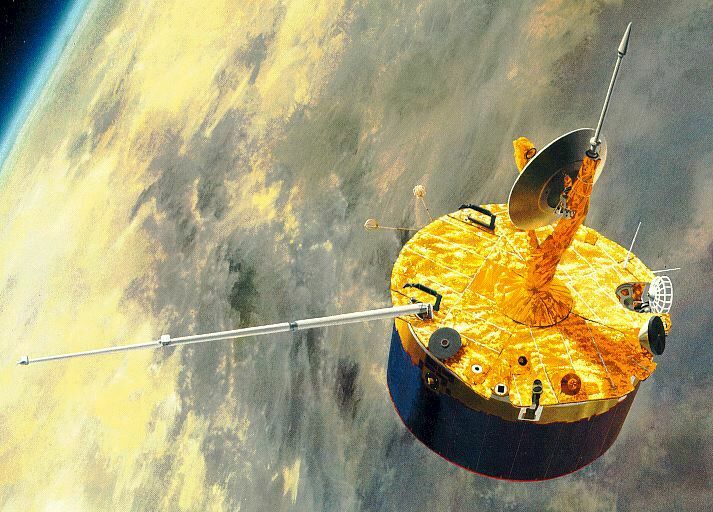 The Pioneer Venus Orbiter was the first of a two-spacecraft orbiter-probe combination designed to conduct a comprehensive investigation of the atmosphere of Venus. The spacecraft was a solar-powered cylinder about 250 cm in diameter with its spin axis spin-stabilized perpendicular to the ecliptic plane. A high-gain antenna was mechanically despun to remain focused on the earth. The instruments were mounted on a shelf within the spacecraft except for a magnetometer mounted at the end of a boom to ensure against magnetic interference from the spacecraft. Pioneer Venus Orbiter measured the detailed structure of the upper atmosphere and ionosphere of Venus, investigated the interaction of the solar wind with the ionosphere and the magnetic field in the vicinity of Venus, determined the characteristics of the atmosphere and surface of Venus on a planetary scale, determined the planet’s gravitational field harmonics from perturbations of the spacecraft orbit, detected gamma-ray bursts, and made UV observations of comets. The data indicated that Venus was much smoother and more spherical than Earth. The orbiter identified the highest point on Venus as Maxwell Montes, which rises 10.8 kilometers above the mean surface. Infrared observations revealed a clearing in the planet’s atmosphere over the north pole. In addition, ultraviolet light photos showed dark markings that covered the clouds in the visible hemisphere. Cameras also detected almost continuous lightning activity in the atmosphere. The spacecraft confirmed that Venus has little, if any, magnetic field. In May 1992 Pioneer Venus began the final phase of its mission, in which the periapsis was held between 150 and 250 km until the fuel ran out and atmospheric entry destroyed the spacecraft the following August. The orbiter cost $125 million to build and operate for the first 10 years. This investigation used a 125 mm Cassegrain telescope on a 125 mm Ebert-Fastie spectrometer with a programmable grating drive. Airglow, scattered sunlight, and hydrogen Lyman-alpha emissions were detected in the thermosphere, mesosphere, and exosphere of Venus. These measurements were used to establish and map the composition, temperature, and photochemistry of the thermosphere and ionosphere, to determine the pressure at and above the visible cloud tops, and to establish the distribution and escape rate of atomic hydrogen. The instrument operated in the 110-340 nm region.